That’s I loved to say to my high school classmate when the math teacher arrived on the day of schoolwork. The temperature is already skyrocketing in Berlusconi’s PdL. The dissenting groups led by President of Italian Chamber of Deputies Gianfranco Fini (co-founder of PdL) have got their signatures - about 50 – and so the former allies – about 75 - faithful to Silvio. 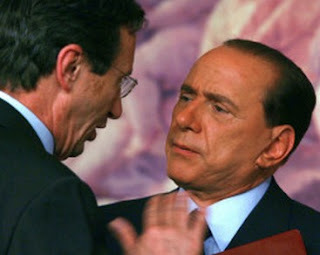 Tomorrow, at the official meeting of the PdL, we’ll see the first face to face confrontation between the different factions in the Italian government coalition, which are essentially two: one supports Fini and the other is with Berlusconi. My question is this: how do centre-right people react to this dispute? Rachele has become eighty last week, but she still seems to be very smart. His eyes are minimized, while the hearing is still working great. She didn’t miss anything, because what comes to his ears is his only contact with the world. That world is divided between the always on TV and his grandson Glauco. He came to stay with her to attend university in Rome. She agreed with joy when her daughter phoned to ask to host him, because then she felt very lonely. However, the young, as polite and respectful, is always out and when he’s at home ever talks with his cell phone. Rachele and Glauco are PdL voters. The former has always been a Right elector, since her childhood, while his nephew is only a couple of years that votes. Now they are both sitting on the couch with the television on. When he’s there, Glauco has always the remote control and grandmother agrees, because for the rest of the time it’s in her hands. Suddenly the cell phone asks Glauco’s attention and he leaves the room, as he usually does. He knew that Rachele has two very developed ears and wants to protect his privacy. The grandmother, taking advantage of his nephew’s absence, changes channel and zaps. After a few minutes she focuses on TV news and immediately captures the words of the conductor, though not from the beginning: "I'm not going to remove the trouble or to shut up, the political leader* said. I hope that Berlusconi will accept the dissent. Then added: A minimum of dignity was necessary... It’s time we look in the mirror and take risks. The follow announcement is clear: now we’ll start a new phase, in which those who have more yarn to weave will begin to weave. And so this solemn declaration: If a man has not willing to fight for his ideas or his ideas are not good or he’s worthless." Just at that moment her grandson found his place on the sofa again, takes possession of the remote control and returns to the serial film which never loses. At that moment, Rachele makes this comment: "It seems that Democratic Party has finally found a leader with the balls…"
"What are you talking about, Grandma?" Glauco asks. "Well, you would understand if you had heard Democratic leader Pierluigi Bersani’s words at the TV news. I can’t believe he’s him…"
The News: Fini: Berlusconi must accept the dissent.